The first two games of the 1917 World Series were played in Comiskey Park. The local White Sox had broken through to win their first pennant since 1906. They faced the New York Giants who were back in the Series for the first time since 1912. 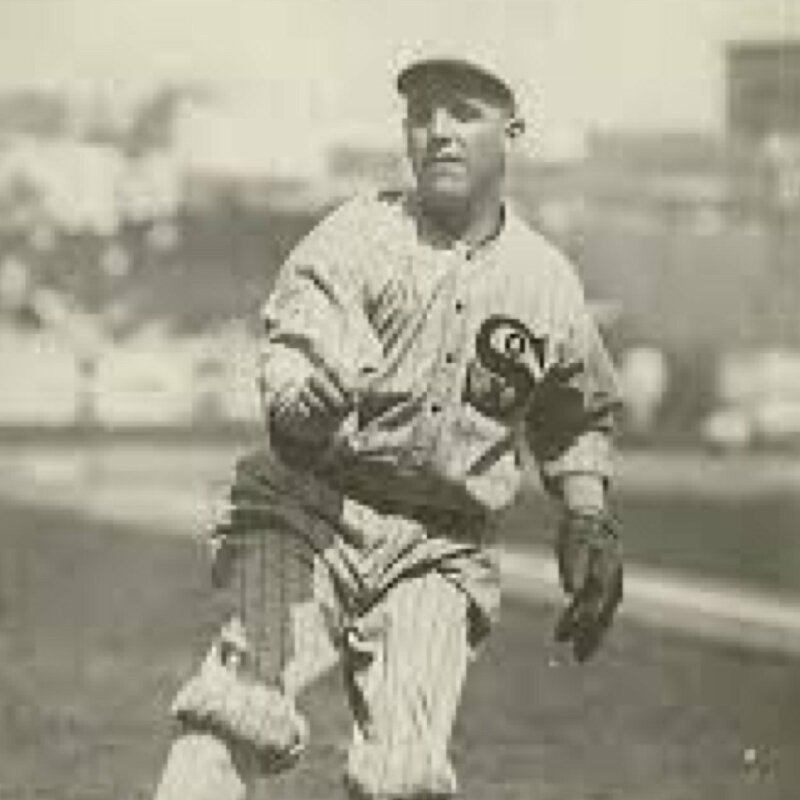 For the opening game, the Chisox sent ace Eddie Cicotte to the mound to face John McGraw’s Giants. New York countered with Slim Sallee. The game turned into a great pitchers duel. Although a few men reached base, no one scored for the first two and a half inning. The White Sox broke through in the bottom of the frame that began with an out. Pitcher Cicotte singled, then was erased trying to go to third on a Shano Collins single. A great throw by Giants right fielder Dave Robertson nailed him, but it allowed Collins to move up to second. A Fred McMullin double plated Collins with the first run of the Series. In the bottom of the fourth Chicago tacked on another run on a Happy Felsch home run. Down 2-0 New York struck in the top of the fifth. Lew McCarthy led off the inning with a triple. Pitcher Sallee then singled to bring him home with the Giants initial run of the Series. A double play and strikeout got Cicotte out of the inning without further damage. And that ended the scoring. Both pitchers continued to record out after out through the sixth, seventh, and eighth innings. There were a couple of hits but no one motored beyond second. In the ninth the Giants went down in order and Chicago went up one game in the Series by a 2-1 score. Both pitchers were stellar. For the win Cicotte gave up seven hits, a walk, and the single run. Sallee was almost as good. He gave up seven hits also, but didn’t walk anyone. The difference was the Felsch homer. If game one was a well pitched duel, game 2 wasn’t. The Sox sent future Hall of Famer Red Faber to the mound. The Giants countered with Ferdie Schupp. Both pitchers had trouble initially. In the top of the second consecutive singles by Dave Robertson and Walter Holke put men on first and second with one out. A Lew McCarthy single to left scored both runs. Chicago replied in the bottom of the second with four singles in a row. Joe Jackson led off the inning with a single, Happy Felsch moved him to second, and Chick Gandil brought him home with the third single. Another single by Buck Weaver scored Felsch and evened the score at 2-2. A Ray Schalk bunt was unsuccessful with Gandil being out at third, but Schupp then walked Faber to reload the bases. That brought out McGraw for a pitching change. Fred Anderson, the new pitcher, picked up a strikeout, then saw a grounder to short get New York out of the jam. It was the highpoint for Anderson. In the fourth the White Sox took his measure and put up four runs. Two singles, an out, and two more singles brought in two more runs and ran Anderson. McGraw brought in Pol Perritt to pitch. He was met by singles by Eddie Collins and Jackson that sent three more runners across home plate to make the score 7-2. Meanwhile, Faber had settled down after the second inning and was setting down the Giants. For the game he gave up eight hits and walked one (the walk came in the eighth). After the second inning, no Giant got beyond second. By the end, Faber had his complete game victory and the White Sox were up two games to none in the Series. 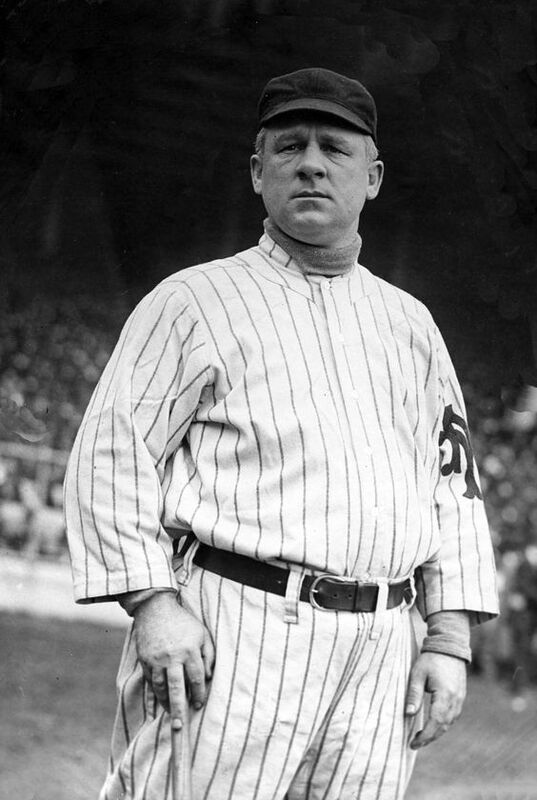 Think about John McGraw. Go ahead, take a minute and conjure up your mental images of John J.. McGraw. I’ll wait. Done? Good. Now I’m going to go out on a limb and guess that not one of those images revolved around winning the 1917 National League pennant. That’s because the Giants pennant winning team is one of the more obscure NL winners and almost no one associates it with the great Giants teams under McGraw. But it may be his finest managing effort. McGraw teams were always built on speed, good defense, and great pitching. This team was really no different, but it was a team that had no truly great player to anchor any of those things around. Christy Mathewson, Joe McGinnity, Rube Marquard, the name pitchers who had dominated all those winning teams from 1904 through 1913 were all gone. You can say what you want about the new guys, but they weren’t nearly the quality of those starters. Here’s the list of every pitcher who started 10 or more games: Ferdie Schupp, Slim Sallee, Rube Benton, Pol Perritt, Jeff Tesreau, Al Demaree, Fred Anderson. Ever hear of any of them? If so, maybe you remember Sallee because he was part of the 1919 Reds that won the infamous Black Sox World Series. Tesreau might strike a bell because he was a holdover from the last Giants pennant winner in 1913. So were Demaree and Schupp (although Schupp only pitched 12 innings). None of them were stars and none were the kind of pitchers great teams hang their hat on. But as a group they pitched well in 1917. They led the NL in ERA, fewest runs allowed, fewest hits allowed, were second in walks, and third in shutouts. How about the rest of the battery? The main catcher was Bill Rariden with Lew McCarty and George Gibson as his backups. It was Rariden’s career year (if you exclude a stint in the Federal League). He hit .271, 34 points above his career average, and had 2.3 WAR, his non-Federal League high. McCarthy hit .247 and the 36-year-old Gibson a buck-.71. None were bad catchers, but only Gibson came close to the league average in throwing out runners (he tied the average at 44%). The outfield was, perhaps, a bit better known. Benny Kauff was a refugee from the Federal League, who’d been a star with the Feds. With the Giants he was good, but not great. He hit .308 to lead the team and his 30 stolen bases were second on the team. George Burns was the other corner outfielder. He was over .300 and led the team in stolen bases and OPS while leading the NL in walks. Dave Robertson played center, hit .259 and led the team with 12 home runs. In in un-McGraw-like fashion he had 47 strikeouts and only 10 walks. Joe Wilhoit and Olympic champion Jim Thorpe were the backups. Wilhoit hit .340 in 34 games while Thorpe hit .193 in 26 games, and, for a player noted for his speed, had only one stolen base. Twenty year old Ross Youngs, a future Hall of Famer, got into seven games during the season, hitting .346 with five runs scored. If there was a proven element on the team, it was the infield. They were, from first around the horn to third, Walter Holke, Buck Herzog, Art Fletcher, and Heinie Zimmerman. Zimmerman was a bona fide star of the era. 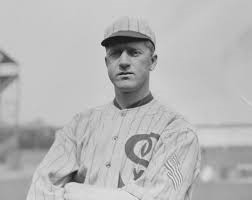 He won the triple crown in 1912, won an RBI title in 1916, and repeated that title in 1917 (he’d later be banned in the fallout from the Black Sox affair). Both Herzog and Fletcher were favorites of McGraw. Both had been with him since 1909. Herzog actually game up in 1908 and had seen short stints with Cincinnati and the Braves. Fletcher had a fine year, leading the team in WAR, while Herzog was getting over-the-hill. Holke was a rookie (he’d had a few at bats earlier) who hung around at first through 1918 then went to the Braves. He hit .277 with 1.0 WAR. As a team the Giants led the NL runs, home runs, stolen bases, OBP, was second in average and hits, and showed up fourth in doubles. In the field the team made the least errors in the NL and was first in fielding percentage. All in all a good, not spectacular team. In many ways it was a typical McGraw team: it pitched well, it ran the bases well, and it was good on defense. What it lacked, and what McGraw had to make up for, was a top-notch pitcher. It is a great credit to him that he managed the team well enough to make up for that things. He would take the team to the World Series, where it would lose to the White Sox.